As early as 9pm on Sunday, temperatures started dipping below freezing. By 6AM the next day it was 11 degrees below freezing. Plants and animals had to withstand 12 whole hours of below freezing temperatures. 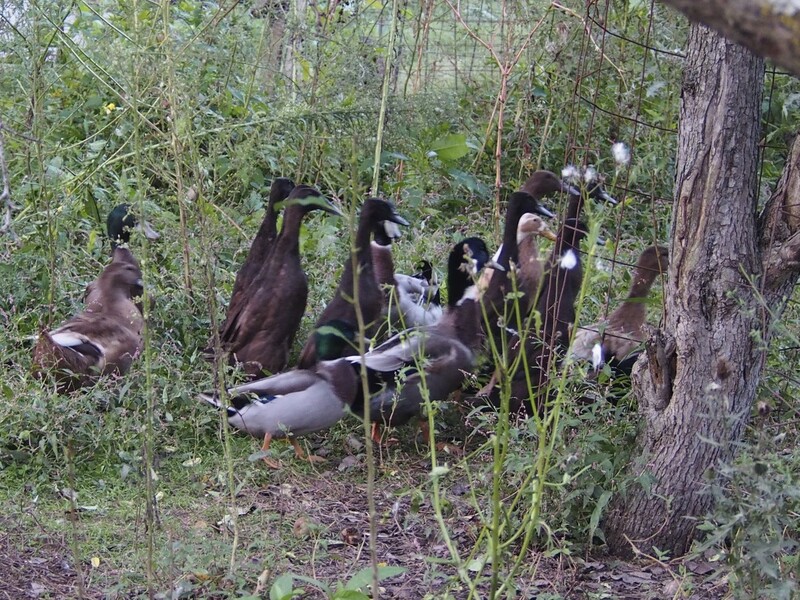 All the animals are fine, although the quail are now protesting by refusing to give us any more eggs. All the summer crops are now gone; and even some of our winter hardy greens sustained considerable damage. Last year we didn’t get a deep freeze like this one until January. 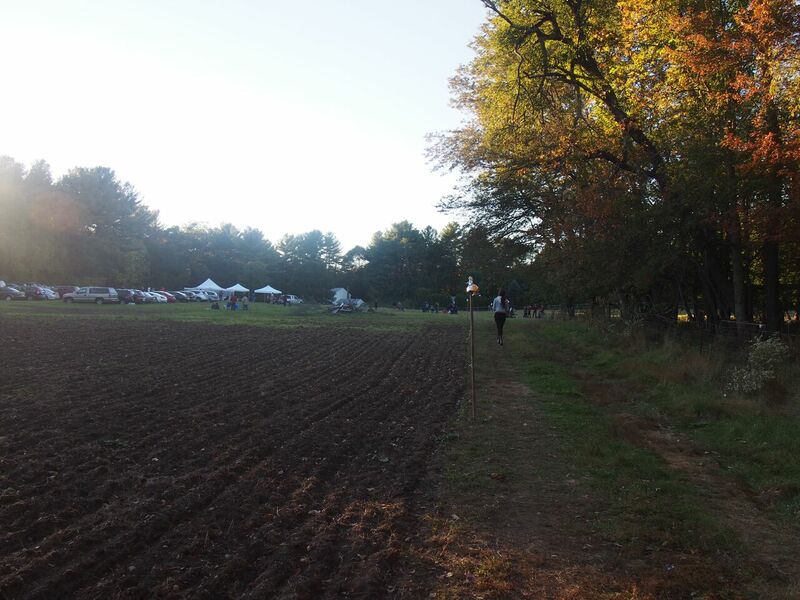 This year’s weather has been unfavorable for farming; no rain in the Spring, a cold Summer, and then a deep freeze in early October. If it continues to freeze, yeah, I might have some trouble filling up your boxes. But as of right now, we are blessed with nature’s bounty – this week’s CSA items include potatoes, orange carrots, yellow onions, autumn olives, and a green (tat soi for JP, bok choy for Revere, broccoli for Quincy, or nappa for Providence). But the focus here is on the Autumn Olives – wildly foraged, washed, and delivered to you! I’m including it in the CSA because it’s like an incredible secret that no one seems to know about. They are all around us. And once you learn to identify the silvery underside of its leaves, you will start seeing them every where you go. They’re quite an amazing tree. 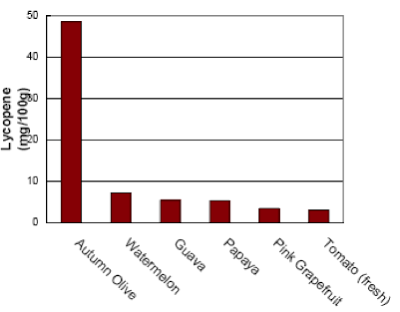 For one, it’s fruit contains an unusually high amount of antioxidant lycopene, in fact 17 times higher than tomatoes. Lycopene is considered an important phytonutrient, and is thought to prevent or fight cancer of the prostate, mouth, throat and skin, and to reduce the risk of cardiovascular disease. Originally from Asia (and they are aka as Japanese silverberry), they were introduced here in the 1930s and 1940s by the Mass Highway Department and planted up and down 95 to provide a windbreak for cars on the highway. They were also planted by the U.S. Soil Conservation Service. Because of its ability to fix nitrogen from the air, it can thrive in depleted and barren soils, and has spread so profusively that it is now considered an invasive species. They also place a significant role as food for animals, since they fruit in October and November when there’s not many other fruits around. 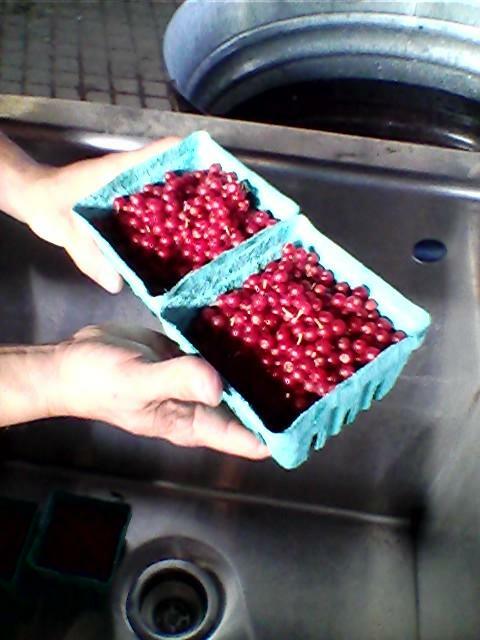 So eat them because they are local (invasive), eat them because you should fight cancer, eat them because they taste great! They have a sweet, tart, and slightly astringent taste which can make your mouth pucker. Use it in a salsa, steak sauce, meat glaze, pie filling, ice cream topping, jams and preserves. Sprinkle some on top of your cereal, in a salad, or on a dessert. They particularly make incredible fruit leather and jam. So let me know if you’re interested in going foraging with me and you can collect buckets full! Despite the onslaught of the cold our eggplants continue to produce abundantly with some reaching sizes bigger than they were this summer! 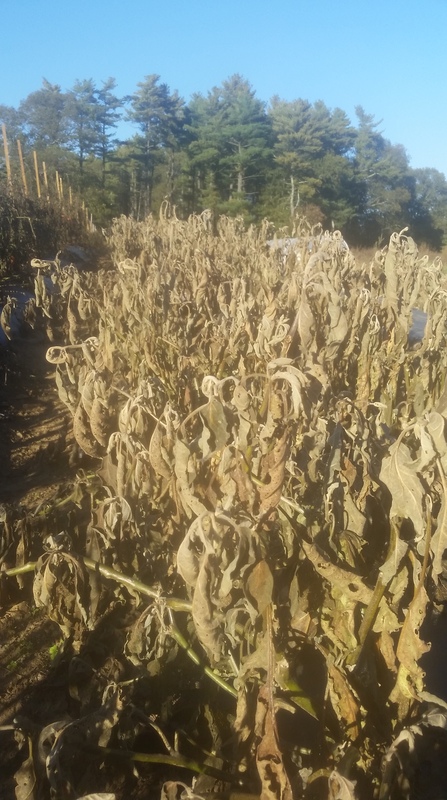 However, the freezing temperatures that are predicted to make fall over the weekend means that most of our summer crops could be dead by Monday morning. It also means that on Thursday I will be preparing my cold hardy plants for the frost (yes they’re cold hardy – but no I cannot afford to risk losing plants to frost on top of all the plants I’ve already lost to the cabbage worm); and on Friday I will be preparing my animals for the frost (just making sure they all have protection from wind). 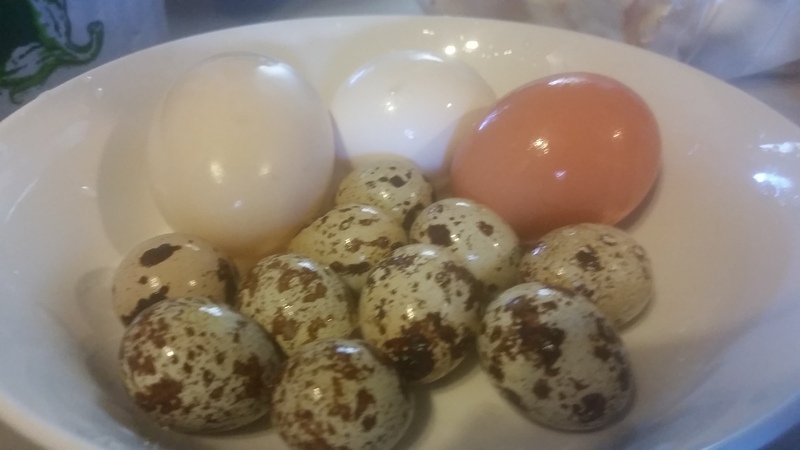 We got two rewarding surprises this week – the first of our quail eggs and a flush of shiitake mushrooms! 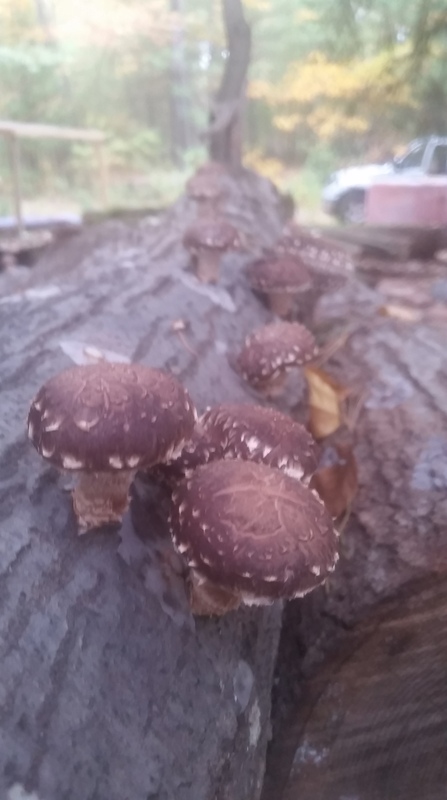 Our first flush of shiitake mushrooms… lets hope it keeps raining and that we don’t go into extreme cold temperatures so that we can enjoy them this fall! 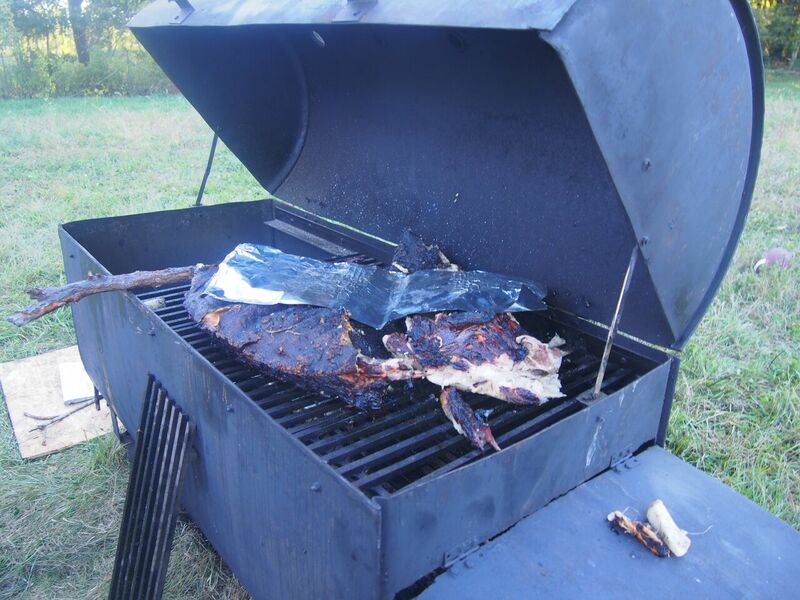 Last week’s pig roast was quite a success! We had about 80 people in attendance. And at least three quarters of us were CSA members and their families! 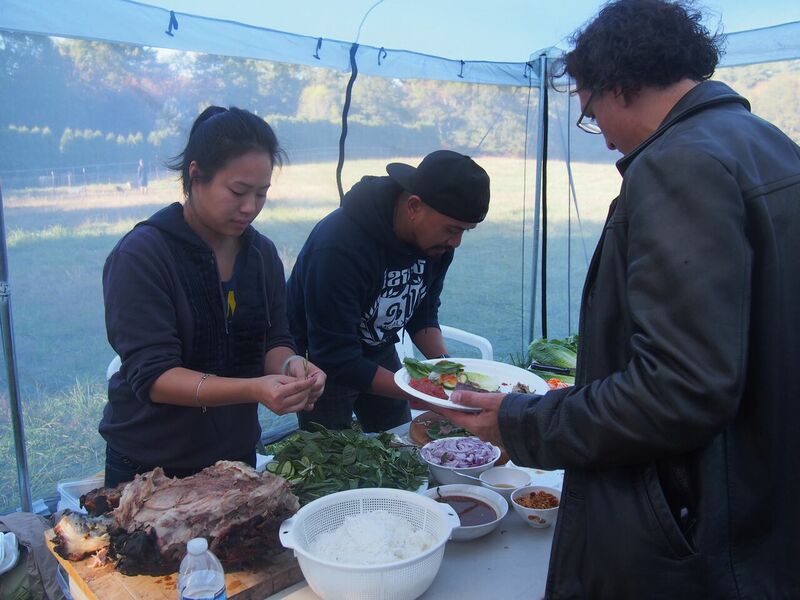 No programming or speaking took place; just food, smiles, and sun shine. From the outset it looked like a multi-racial, queer-friendly, urban-oriented crowd of food loving foodsters from the Boston and Providence metropolitan areas. And maybe the focus should just have been on the food, grass and the sun. But what’s exciting is that we are much more than that: many of our relationships have been formed for over a decade, and all of us are connected to campaigns, organizations, and movements waging cutting edge social change agendas, from worker’s and immigrant’s rights to the struggle for LGBTQ and racial equality to campaigns to halt the devastating effects of the oil industry that disproportionately affect those who are most disenfranchised. We are in Jamaica Plain, Quincy, Providence and beyond, and we teach in the halls of Brown University, work in organizations funding indigenous farmer-peasant movements in the Global South, and lead campaigns to make racial and “gang” profiling illegal. Sarath and Elaine preparing fresh chunks of pork wrapped in lettuce and dunked into a tamarind sauce, being served to Tarso! For those of you who missed the event, here’s a small synopsis: an old oil drum was converted into a professional looking grill. 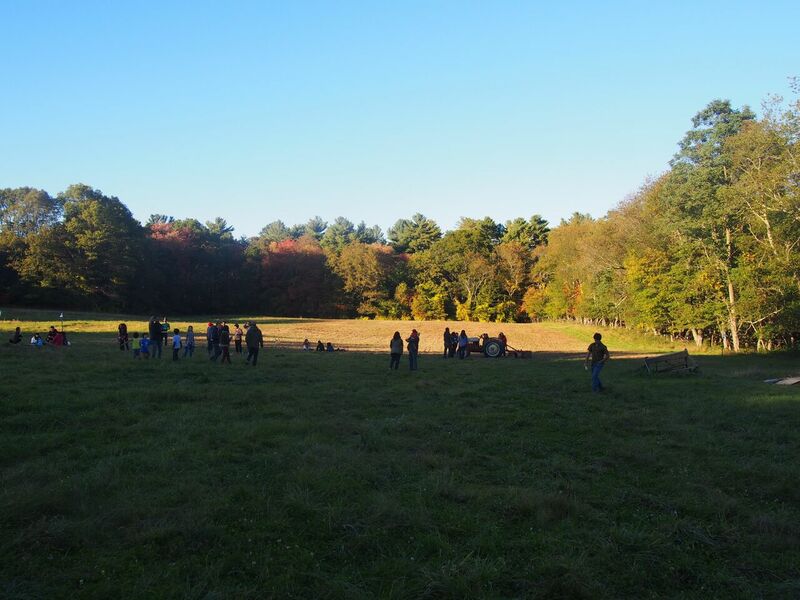 The pig was raised over at Freedom Food Farm in Raynham on organic pasture fields. 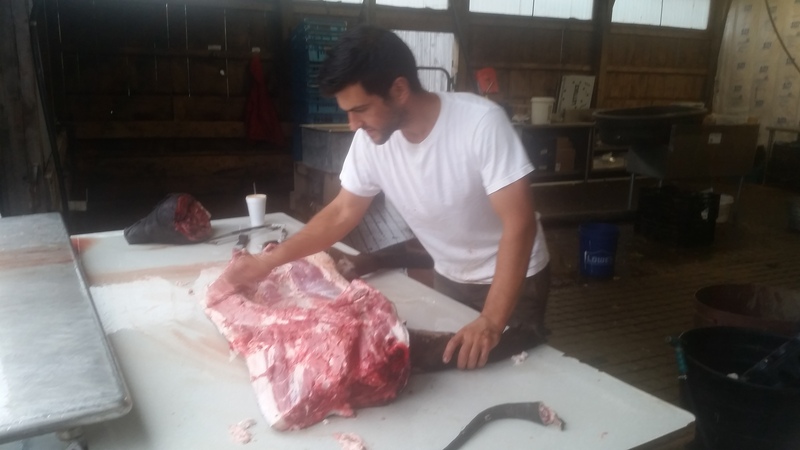 On Friday the pig was slaughtered and butchered, and was thrown on the grill on Saturday morning at 6AM and seemed to cook fairly quickly; it seemed to be fully cooked by 12PM. Food was plentiful, and everyone I asked told me that they had all three pork dishes – the tacos, the Cubanos, and the Khmer lettuce wraps. The vegan & vegetarian table was overcrowded with food and spilled onto a second table. 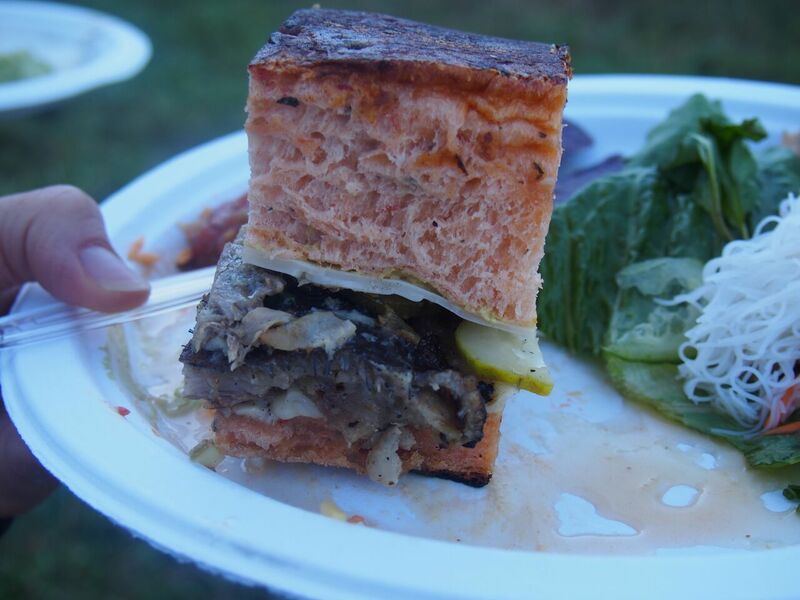 Pat’s Cubano sandwich…. never had one that was so delicious! Week # 4’s produce includes red beets, bok choy, delicata winter squash, Italian eggplant and a hot chili pepper medley. 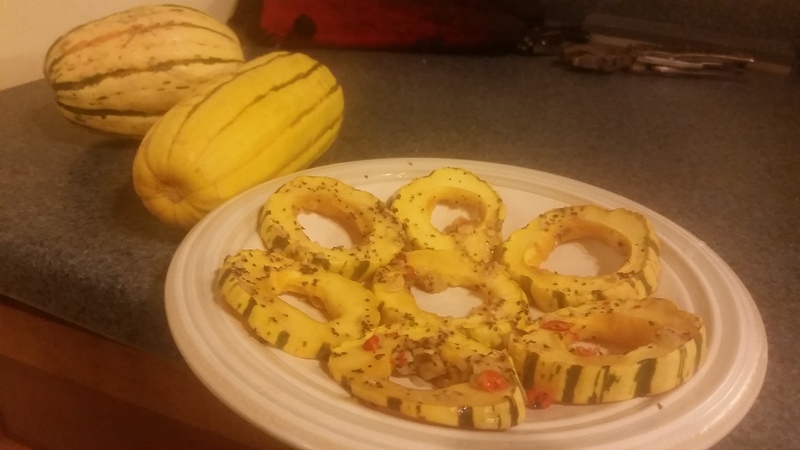 If you haven’t yet had delicata squash then you might join the many who call it their favorite of the winter squashes. It has light yellow flesh like an acorn squash but it’s texture is less threadlike; more solid than the flesh of an acorn but more soft than the flesh of a butternut squash. It’s small size also makes it appealing – one or two squash can be consumed in one meal. There is no need to peel em’- I love Delicata sliced in rings and then roasted in the oven with a bit of olive oil and herbs. They are very versatile. Don’t be afraid to bake, boil, roast, grill, stir fry, steam or fry your winter squash. They can be prepared whole, in halves, quartered, cubed, sliced, and even shredded. If you drew the lucky box this week, then you are in store for a half dozen of beautiful white duck eggs. The team of ducks have been fattening up all spring and summer to plop out an orb filled with a rich, creamy golden yolk, surrounded by a light white. Anything you can do with a chicken egg, can be improved with the use of a duck egg. Bake with them to really give your bread or baked goods an extra dimension of fluffiness. Crack one into the skillet for a more substantial breakfast. The shell is thicker, so give your egg a harder whack than you would with a chicken’s. Scrambled, you’ll find them much richer than chicken eggs. You will be hard pressed to find duck eggs elsewhere, so if you strike gold this week make sure you enjoy all six of these treats. 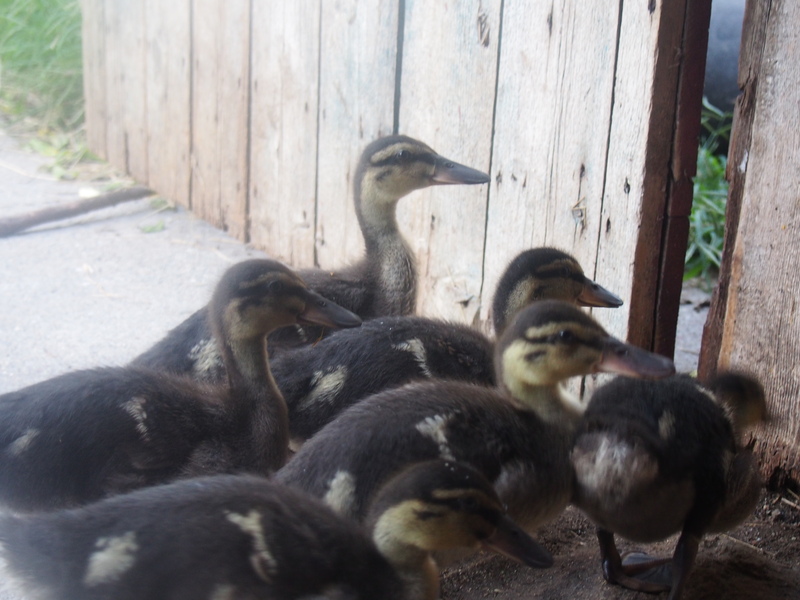 Our flock of ducks, always waddling in unison.